A quiet hotel with meeting facilities on the grounds of Huntingdon RacecourseHoliday Inn® Huntingdon - Racecourse hotel is conveniently close to the A1 and the A14.We’re 10 minutes by car from the historic market town of Huntingdon, and it's a short drive to Cambridge for visits to centuries-old colleges, pub lunches beside the River Cam or shopping expeditions at Grand Arcade. Take the kids to meet big cats and cute marsupials at nearby Hamerton Zoo Park. Tudor manor Hinchingbrooke House, only 2 miles away, hosts weddings, dinner dances and other glamorous events. The Hinchingbrooke and Ermine business parks are close by, and you can host your own event for up to 60 guests in our 3 well-equipped conference rooms. Our friendly staff are happy to help with planning and catering.At this hotel you can enjoy:- Free WiFi- Free parking- Kids stay and eat freeWe have smart executive bedrooms with balconies overlooking the track and comfortable rooms for families. Coach parking is available onsite, and there’s even a charger for electric cars. You can work out in the mini-gym, and hot meals are available all day in the conservatory or on a terrace in the garden. The welcoming Open Lobby is a relaxing spot for a Starbucks coffee, the To Go Café offers snacks around the clock and you can watch TV or enjoy a drink in our laid-back Media Lounge. Make yourself at home in one of the 5 guestrooms featuring refrigerators and flat-screen televisions. Digital programming and DVD players are provided for your entertainment, while complimentary wireless Internet access keeps you connected. Bathrooms with showers are provided. Conveniences include coffee/tea makers and irons/ironing boards. Take in the views from a garden and make use of amenities such as wireless Internet access (surcharge) and babysitting/childcare. This bed & breakfast also features a picnic area and barbecue grills. Take advantage of recreational opportunities offered, including an indoor pool, a spa tub, and a 24-hour fitness center. Additional amenities at this hotel include complimentary wireless Internet access, concierge services, and wedding services. 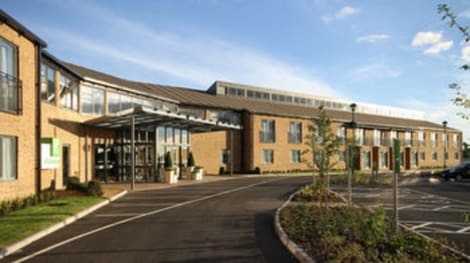 When you stay at The Prince of Wales in Huntingdon, you'll be within a 10-minute drive of Papworth Hospital NHS Foundation Trust and The Manor at Hemingford Grey. This inn is 15.2 mi (24.4 km) from University of Cambridge and 14.7 mi (23.7 km) from King's College. Stay in one of the guestrooms featuring flat-screen televisions. Complimentary wireless Internet access is available to keep you connected. Conveniences include phones and coffee/tea makers, and you can also request irons/ironing boards. Located in Huntingdon, The Thorpe Guest House is a 3-minute drive from The Manor at Hemingford Grey and 8 minutes from Island Hall. This bed & breakfast is 5.4 mi (8.7 km) from The Cromwell Museum and 5.8 mi (9.3 km) from Raptor Foundation. Located in Huntingdon, The Willow Guest House is a 2-minute drive from The Manor at Hemingford Grey and 9 minutes from Island Hall. This 4-star guesthouse is 15.4 mi (24.8 km) from King's College and 15.9 mi (25.6 km) from Cambridge Corn Exchange. Huntingdon is a bustling market town in Cambridgeshire, in south-east England. With a rich history and some stunning architecture, the town is well worth a visit, whatever the season. Moreover, your Huntingdon hotel offers an excellent base from which to explore this fabulous area. The town is perhaps best well-known as the birthplace of Oliver Cromwell, whose life began here in 1599. Already by then, Huntingdon was a thriving centre of commerce, and this wealth and heritage are reflected in the town's beautiful buildings. Start your journey through time in Huntingdon's ancient Market Square. From here you will be able to see the Town Hall, a majestic building built in 1745. For more information on the town's famous son, pop in to the Cromwell Museum, which is free of charge and offers a fascinating insight into the man who changed the course of England's history. There is further evidence of Cromwell's legacy at the old Falcon Inn, another lovely old building on the square. Though it is no longer used as a public house, this building was Cromwell's main headquarters during the English Civil War. If you want to experience what Huntingdon might have been like in the Middle Ages, there is still a weekly market held not far from the square. The modern Huntingdon Market takes place every Wednesday and Saturday between 08:00 and 16:00, although the wares on offer have probably changed a bit since Cromwell's time, in case you want to pick up a new sword. No trip to Huntingdon is complete without an appreciation of the serene beauty of the River Ouse. There is a lovely park called Riverside Park that runs along the Ouse and is the perfect spot for a summer afternoon picnic. The park follows on to a path that turns into a sumptuous tree-lined nature trail. You must, of course, also take a walk across Huntingdon Bridge and into the neighbouring town of Godmanchester. The 14th-century bridge was made out of local stone and does much to augment the romance of the town. There is no need to hunt for a place of refuge in Huntingdon, as the town still retains many of its historic inns. The George Hotel was once owned by Cromwell's grandfather and has been serving up warm plates of delicious food ever since. Another must-visit is the Market Inn, reachable by an alley from Market Square. The Inn still has its original Tudor upper storey and offers the opportunity for a pint to remember in an unbelievable setting.